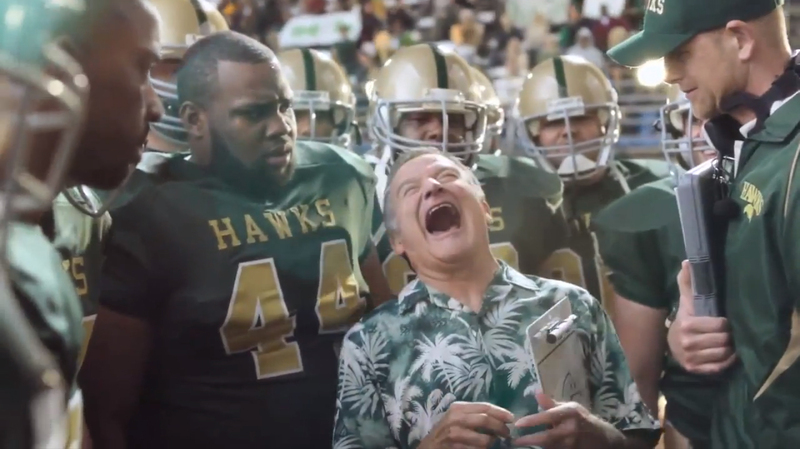 As the world laments the passing of comedian Robin Williams, we revisit his appearance in the Snickers Coach commercial, launched in January 2013 as part of the “You’re Not You When You’re Hungry” campaign. Robin Williams appeared as a floral shirt wearing coach giving crazy advice to the Hawks football team at half time. When presented with a Snickers bar Williams took a bite and was transformed into the team’s real coach. Fellow comedian Bobcat Goldthwait had a cameo as a hungry cheerleader. 4th down, coach. What do we do? I’ll tell you what we do. I want you to go on the field, look for anything with an “O”. Let’s kill them! With kindness. Jimmy! I want you to make balloon animals. Tyler, make little tea cozies, something fun. Ha ha ha ha ha! We will win this for mother Russia! You get a little loopy when you’re hungry. Better. Now let’s go for it! Go get ’em guys! Ahhhh! You’re not you when you’re hungry. Snickers satisfies. The Snickers Coach Robin Williams ad was developed at BBDO New York by chief creative officer David Lubars, senior creative directors Peter Kain and Gianfranco Arena, associate creative director/art director Jon Kubik, associate creative director/copywriter Adam Noel, executive producer Amy Wertheimer, managing director Kirsten Flanik, senior account director Kathryn Brown, account director Justin Zerrenner, account manager Price Manford. Filming was shot by director Craig Gillespie via MJZ. Editor was Ian MacKenzie at Mackenzie Cutler. Colorist was Tim Masick at Company 3. Visual effects were produced at Eight VFX. Sound was mixed by Tom Jucarone at Sound Lounge.